If you have not already heard of and visited Janet Hill's Studio, do yourself a favour and do it now. She is the most amazing artist I have seen for ages. I absolutely love every single one of her artworks! This painting is a particular favourite. 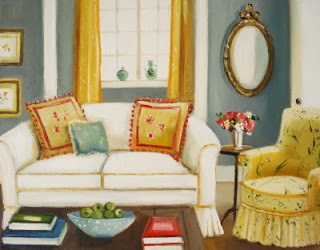 It is called "The Yellow Chintz Chair". It has already sold but how I would have loved to have owned it. It immediately calms me when I look into it. What an amazing talent she has. Don't you think? Thanks too for all your lovely comments on yesterdays post. Going through some of my older photographs last night I stumbled across this one. It was taken by the very talented Anna Spiro of Absolutely Beautiful Things. She visited my house last year for little (big) party I had. This photo really sums up my decorating style and I thought I should share it with you today. We have many sofas and chairs in our main living area. Most are mismatched. Most are from cheap stores (like Ikea), second hand stores and Ebay ( got the wing back for $100). I wanted to create a space that made people feel at home as soon as they walked in. What do you think? Couldn't help but day dream a little when I came across this photo from America's Better Homes & Garden website. 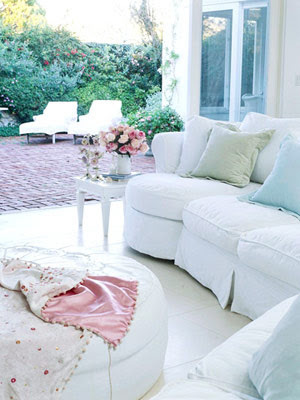 I just love the "softness" this room conveys. It's a very casual and calming space don't you think ? I adore the little side table with the overstuffed vase of blooms. Oh how I love flowers. Off to my flower man again this afternoon. I have my own vases to stuff. 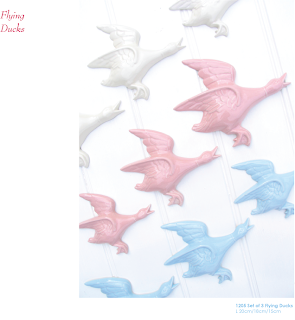 I am loving these flying wall ducks from Robert Gordon Australia. They come in lots of pretty colours too. They remind me of my great Aunts vintage mallard ducks that adorned her kitchen wall. She would cook for hours in that kitchen of hers. I would sit and watch and we would sing together. I was only two years old and she has long passed now, but I can still see that kitchen when I close my eyes. And I can still see those ducks on the wall too. 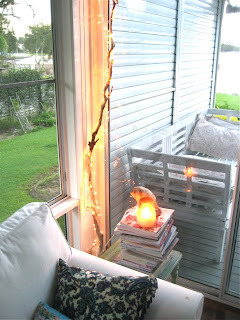 Project Day: I Found Some Driftwood ! I found the most wonderful piece of driftwood while walking along the beach the other day. It was so textured and worn. I just could not let it go. But what would I do with it? Here's what. I grabbed some fairy lights and, starting from the bottom, I wound them all the way to the top. So so easy to do. So so very lovely at night. Have a great weekend everyone. 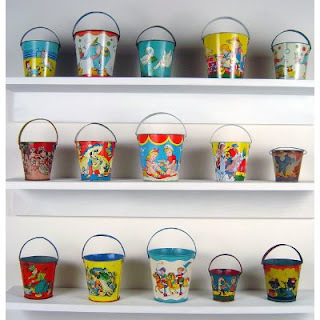 Oh how I wish I could get my hands on this collection of vintage children's tin buckets. They look so beautiful all grouped together. To think they have lasted all this time, unlike the horrible types of modern times. Can you imagine what a plastic bucket would like like in 50 + years? I am in love with this nautical wallpaper from Thibaut. It truly is inspiring. We are renovating our bathrooms over the next few years and how I would love to achieve a result like this! 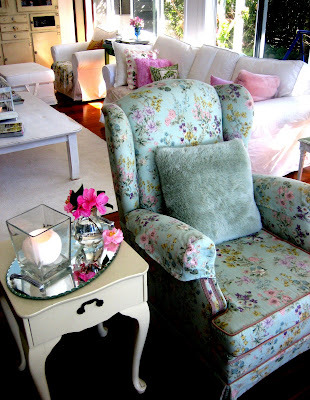 I particularly love the co-ordinated chair with matching fabric. How devine. These colours get me everytime. I am a prisoner to pink & blue! It started with one. 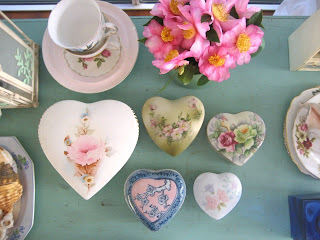 Just one lonely heart shaped trinket box I found at a flea market one day. Then a few months later, I found another, then another. Now I have started a small collection of them. Grouped together on my table they look quite lovely. It's funny how you can start a collection of something without consciously knowing it. I wonder where my next one will be hiding? Which one is your favourite? I love to have flowers in my home at all times. I use everything from old bottles to vintage vases to display them. On my usual Saturday morning trip to the tip I purchased an old English china teapot ( I can't believe someone threw it out ) for $3.00. It is very similar to the one shown in this picture. How lovely it will look when I fill it with blooms tonight. What a beautiful idea. 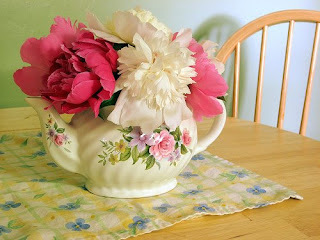 Do you have an old teapot hiding somewhere that you could do this with? It's Friday again and it's project day again. 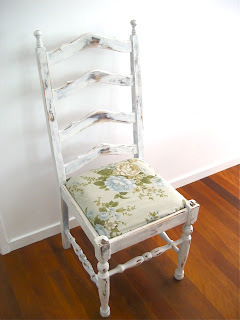 Today I want to show you what I did with an old kitchen chair I found at the dump and purchased for $5.00. It was so horribly brown and ugly. I roughly sanded it back with an electric sander then painted it white. I found an old pillow case that I cut up and placed over the seat (no sewing required as seams were already there). To finish it off I roughed it up a little to create some wear and tear. All up it took a little over 2 hours to do. I loved the end result so much I went back and purchased the other 3 matching chairs that were left behind. I will give them all the same kind of treatment. I think they kind of like it. Have a great weekend. I cant stroll past my local antique shop without stopping. It's hopeless. So look what I found hiding in the corner today. 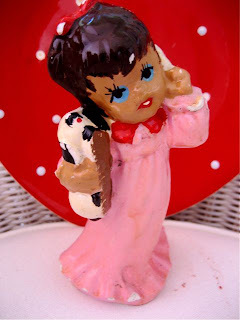 A cute ceramic figurine of a little girl holding a dog and a telephone. At $8.00 I couldn't resist her. She's cracked and chipped here and there but that just adds to her beauty. I haven't decided where to put her yet but I am sure she will find a place somewhere. I just love vintage children's figurines. They have so much character and beauty. I could decorate a whole room based on her colours. Too cute! Lately I have been using candles to light our home at night rather than electricity. It always amazes me how many lights are left on in empty rooms at night. I have been guilty of it myself ! It only takes a few candles here and there to light our room quite well. 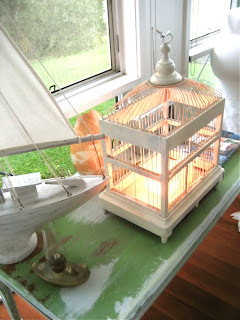 I purchased this second hand ornamental birdcage from EBay and decided to place a few candles inside. It changes the mood of the entire room when I light them at dusk. It's so much more relaxing to watch a candle burn than a bulb. Why don't you give it a try yourself? Hope everyone had a safe and happy Easter. 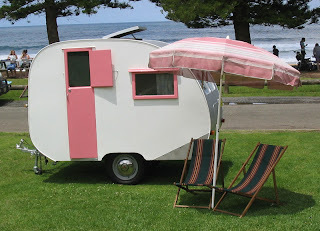 This is just the most gorgeous little caravan I have ever seen! Can you imagine pulling up on the beach somewhere and putting your bathers on, grabbing a magazine, listening to some AM on the transistor radio and just relaxing? Maybe drink some iced tea or something stronger......Wow, they just don't make them like they used too. And of course my favourite thing about this photo? The co-ordinating umbrella. Are we there yet? I have a weakness for collecting vases and ornaments. I am forever bringing them home. This idea is a great way to display them without "over cluttering" your home. 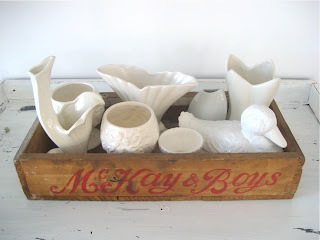 I found this old wooden crate for sale at a second hand store and decided it would serve great as a holder for all my "white things". I randomly placed them inside to fit. This idea works best if you group items of the same colour. So why not try this idea for yourself. Placed on my hall table it really makes a statement, more so than if they were all scattered around the place. As you are all well aware Easter is upon us once again. Hope you have a great one and I will talk to you next week. Happy Easter. Every year our family gets together at Easter for an egg hunt. It has been happening ever since I can remember! 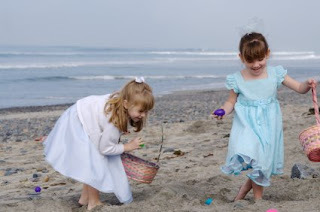 This photo has inspired me to maybe try a little something different this year and hide the eggs on the beach. So much more exciting than the backyard don't you think? Can you believe these were left out on the street for collection by council cleanup? I would have had a car accident if I had drove past these! 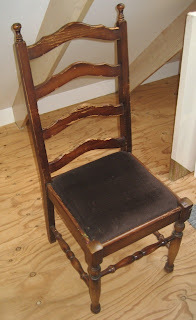 I have a passion for old wing back chairs. I have two at home which I purchased second hand on EBay. 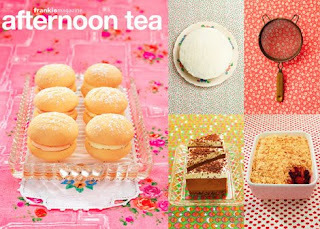 But I have secretly wanted pink velvet one's just like these. How devine. Council clean-ups happen twice a year in most Australian suburbs and it's amazing what is left on the road for collection. Keep your eyes peeled. 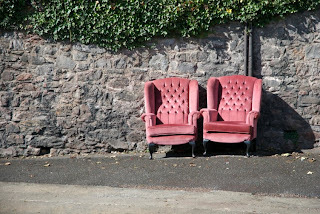 Have you found anything thrown out on the road that you have used in your home? I would love to know about it. 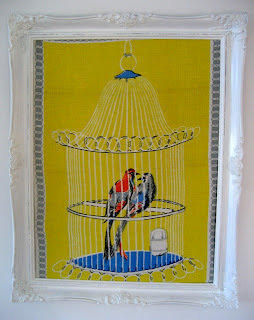 Items needed: Vintage Tea Towel & a Shabby Frame. For this simple yet stylish piece I simply purchased a vintage tea towel (try EBay or here) and an old gilt style shabby frame . I removed and discarded the glass and painted the frame white. Using the old back mounting plate I placed the ironed tea towel inside the frame and put it all back together. What's great? You can change it anytime to suit your decor or your mood. Anyone can create this look. Its easy, fun and it gets lots of comments at dinner parties. Everyone loves it ! Have a great weekend and I will talk to you all next week. 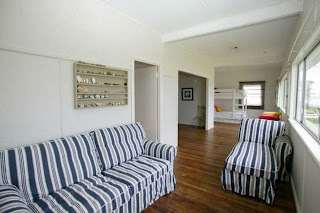 I recently rented a small fibro beach shack in the sleepy coastal township of Brooms Head in NSW, Australia . It was the most devine little place. I found out the owners had recently refurbished it. They couldn't spend alot of money so they went about it as best they could. 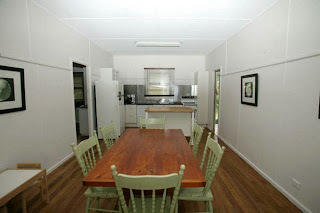 Fresh white paint on the interior, floorboards sanded, ikea kitchen & sofa's. Then they mixed it all up with vintage and op shop finds. There is no air conditioning or mod cons but it all works so well, and as soon as you enter the house you can feel the instant coastal charm. My favourite thing? 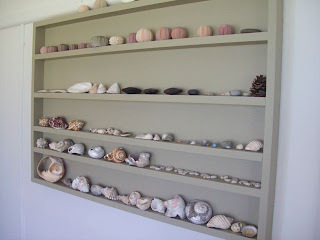 The wall mounted shell display (everyone that stays is encouraged to add to it). This house has a real touch of nostalgia about it. It inspires me to live a more simpler life. Where the biggest drama is how to keep sand out of your sandwiches and how many swims you can squeeze in before dinner time. Do you remember times like this? What wonderful memories. I can't wait to return.